(Sir) Paul McCartney played a ‘secret’ show here in L.A. on Wednesday at Amoeba on Sunset. Secret is a bit of a misnomer as the sidewalks were jammed with people waiting in line for wristbands days in advance. This in-store was of course part of the promotional blitz supporting Macca’s new album Memory Almost Full that was released on the Starbucks Hear Music label. Can I get a non-fat, soy latte with that? 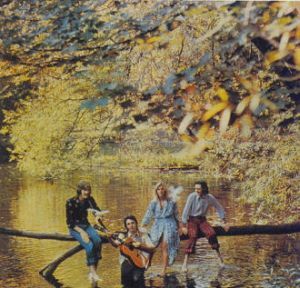 I haven’t yet checked out McCartney’s new jams, but one track I revisit on a regular basis is the 1971 Wings joint “Love Is Strange” off the Wild Life LP. If you love McCartney at his breeziest and poppiest, “Love Is Strange” is an absolute must listen. The album was Paul and (new wife) Linda McCartney’s first musical collaboration and is a bit of a mixed bag with a smattering of solid tracks throughout — “Love Is Strange” being my favorite. The bouncy instrumentation, casual attitude and lyrics would set the pace for many a Macca track throughout the 1970s. I always felt like Wild Life was one of McCartney’s worst albums. The reggae influence sounds weak, and the songs lack solid hooks. Of course he would make up for that with Band on the Run. I sort of like Wild Life, although it’s not one of his best. For me his low point is pretty much all of the 80s synth-echo-overproduced nonsense. Even “Flowers in the Dirt” is regarded as one of his best albums, but to me, the low points (“How Many People”, “Ou Est Le Soleil”, “You Want Her Too”, etc. don’t make up for the highs (“My Brave Face”, “Put It There”) amazing though they may be. I’d take the early 70’s lightweight ditties of “Wild Life” over “Press to Play” any day. Actually, the first collaboration officially with Paul and Linda was the Ram album, which proceeded this album. And the solo McCartney album, which came before Ram featured Linda singing on most tracks, too.